Raymond Bobgan, Executive Artistic Director, Cleveland Public Theatre. Photo by Rob Muller Before he was born, Raymond Bobgan, who grew up in California, had an artistic connection to Cleveland. His mother, a theater and dance major at the University of Minneapolis, traveled here to audition for a New York dance company. When his father found out, he drove from Minneapolis to propose at a time when a woman’s first commitment was to family. She accepted, effectively ending her artistic career. “It’s weird that all these years later, I ended up in Cleveland continuing where she left off,” Raymond observes. In California, Raymond jumped into theater early when his mother cast him in plays she directed at their church. By second grade, he was writing plays for puppets, and in sixth grade, he devised his first theater production. “That’s when I said, ‘If I could do this for the rest of my life, that would be awesome,’” he recalls. At San Marcos High School, he directed several plays, before enrolling at Santa Barbara Community College. He directed there, as well, but a history of set design class changed everything. One day the teacher wrote several names of experimental theater innovators on the board, including Jerzy Grotowski, the Polish theater iconoclast famed for devising minimalistic, highly stylized performances for small, intimate audiences. When Raymond learned Grotowski was teaching part of the year at the University of California, Irvine, he transferred in the fall of 1988. Working closely with Grotowski and his assistants, he excelled at the intensive physical training in movement. But because Raymond’s emerging process and aesthetic diverged from the master’s approach, when part of the group went to Italy the following spring to continue studying with Grotowski, he moved to Akron, where he could work as an assistant with the New World Performance Laboratory. That wasn’t exactly his goal. “I really wanted to create and direct my own theater,” he says. He became the Education Director, and for the next few years, he worked in various positions; he and his wife Holly, whom he had met at Grotowski’s program at Irvine, even ran the theater for two years while Levin took a sabbatical. 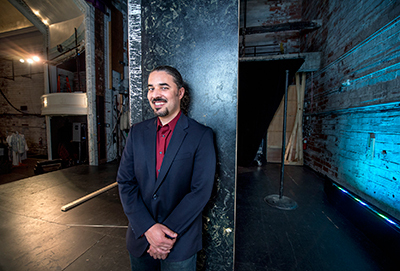 He has been continuously involved at CPT since 2000, when a sizable Pew Grant paid for him to be a resident artist for two years to build his original production Blue Sky Transmission, one STEP show, and one show for Y-Haven, a community program for recovering alcoholics and substance abusers. During those years, he also did productions with his own company, Theater Labyrinth, later Wishhounds. Eight years ago, he was named Executive Artistic Director, and he chose to recommit to everything upon which CPT was founded. For Raymond, it’s always about creating the most significant work that will entertain audiences, but also drive them to engage and reflect. “We all want to work together again and again, because we believe that’s how you get great, deep work,” he concludes.